The Redemptorists » Congratulations to Indianapolis Archbishop Joseph W. Tobin, C.Ss.R.! Today we celebrate with Redemptorists throughout the U.S., and with the Archdiocese of Indianapolis, as they welcome their new bishop, Redemptorist Joseph W. Tobin. Archbishop Tobin’s installation Mass will be livestreamed online through the Archdiocese of Indianapolis website, as well as televised on EWTN and on Boston’s CatholicTV. 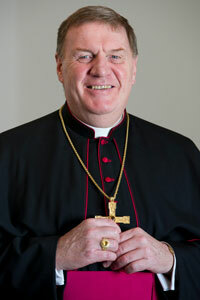 Our heartfelt prayers and best wishes go with Archbishop Tobin as he begins his new ministry! May St. Alphonsus Liguori, St. John Neumann, and Our Mother of Perpetual Help pray for us!